1. Grind coconut and cumin seeds to a fine paste. 2. Heat oil in a heavy bottomed pan/non-stick pan. Add ginger, garlic, green chilies, curry leaves and chopped onion. Saute until onion turns lightly brown. Add chopped tomato and saute until it gets mashed up. Bring down the heat to low and add the masala powders numbered 4. Saute until their raw smell is gone, about 2 – 3 minutes. Add 1.5 cup water and enough salt. 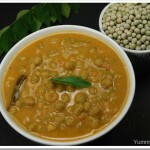 Bring to a boil, add the cooked chana and cook for about 6 – 8 minutes. Add ground coconut and cook until the raw taste of coconut is gone, about 8 – 10 minutes at medium-low heat. Add 1/4 tsp garam masala powder and mix well. Switch off. Serve hot with chapatis / appam/ idiyappam/ puttu etc. Love white channa recipe forever ! Eventhough this looks awesome, do u have any other method to prepare white chana other than this way? As my hubby doesnt like the taste of cumin seeds !! You can avoid using cumin seeds in this recipe. Or you can use fennel seeds instead of cumin seeds. I make chana masala with white chana but that recipe also calls for cumin seeds..